The men of Cain Hibbard & Myers endured rainy weather, catcalls and blisters as participants in the first “Walk A Mile in Her Shoes” held in Berkshire County. 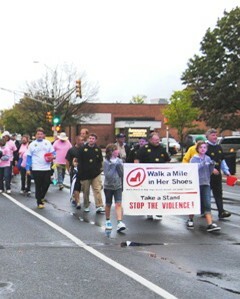 Donning pink t-shirts and high heeled shoes, these men joined with other community members to walk the mile from Pittsfield’s Park Square to Maplewood Ave. and back as part of an effort to raise awareness about all forms of gender-based violence. Funds raised from the event went to the Elizabeth Freeman Center, the county’s provider of services for survivors of domestic violence and sexual assault. Cain Hibbard is a strong supporter of the Center and its mission.